I definitely approve of this. I love it so much more than the caramel Freddo. It’s sweet and delicious.the white chocolate is so yummy ! 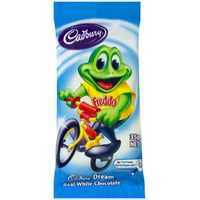 Cadbury giant white choclate Freddo Frog was a favourite to buy at the local newsagent growing up and l still love the taste of it,delicious! White chocolate is probably the worst for you, yet it tastes so good. Freddo in all flavours is the best really.This one is just big enough to be a decent sized snack and taste. A wicked and wonderful Cadbury Dream Giant White Chocolate Freddo Frog is simply delicious and sweet and such a wonderful chocolate treat. I always buy these chocolate frogs when anyone is selling charity chocolates or when I can locate them in a local store. How would you rate Cadbury Dream Giant Freddo Frog White Chocolate?